As I wrote about in my reflection for the April 2014 issue of One Spirit, Many Voices newsletter, “Acknowledgment can be used in two ways. One is the “acceptance of the truth or existence of something.” The other is the “action of expressing or displaying gratitude or appreciation for something.” Both are important in the healing process.” Sometimes what we need to acknowledge is what is unfinished in our lives. 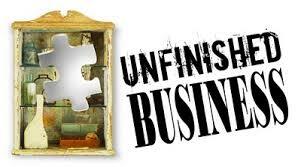 When I think of stories of unfinished business, I am reminded of the story in John 5. This man had been sitting at the source of his healing for 38 years waiting for others to help him or to be able to get himself in the pool next. In John 5:7 he says “Sir, I have no one to put me into the pool when the water is stirred up; and while I am making my way, someone else steps down ahead of me.” this man has not looked the situation in the eye, he has not acknowledged what he has not done and so passively says it is somebody else’s fault that I am in this position.